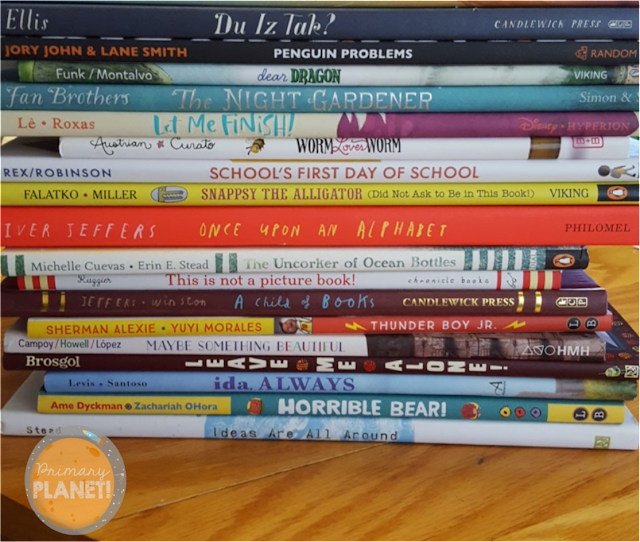 Book Talk Tuesday: Shy with a Free Reading Response | Primary Planet! Welcome to another Book Talk Tuesday! I am so glad that you stopped by! 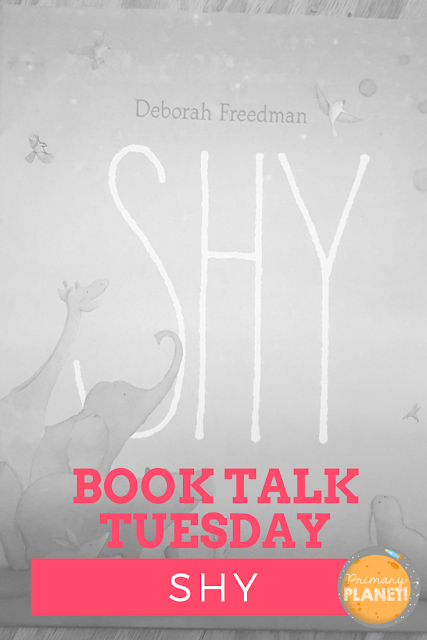 This week I want to talk about Shy by Deborah Freedman. I found this book in a list of the best books of last year by the Nerdy Book Club! You can find their post about this lovely book HERE. Oh my goodness! This is an absolutely beautiful book! The illustrations are gorgeous. This is a book about Shy, who is, as you can probably guess...shy. He prefers to live between the pages of a book. His favorite books are the ones about birds. He finally gets to see a bird in real life! I won't ruin the book for you, but it is lovely. 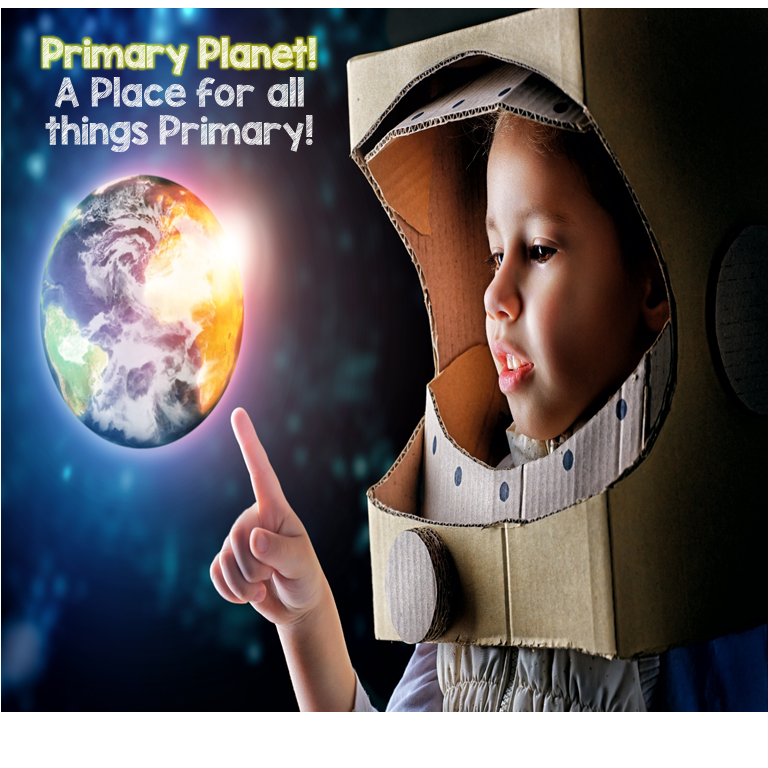 This is a great book for predictions, understanding the feelings of others, making connections, and problem and solution. My freebie is great for book clubs, read aloud, or as a response when the kiddos read the book on their own! I used this book as a read aloud. 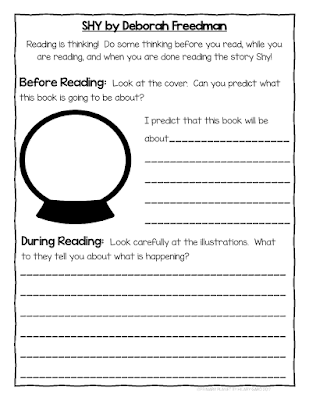 Before reading the kiddos used the reading response to make a prediction about what we think the book will be about. I tell the kiddos to make sure that they pay close attention to what is going on in the pictures, and stop periodically for the kiddos to write down what is happening in the illustrations. We also talk about and write down who the characters are and what the problem is! Then when the story is over we finish filling in the response with how the problem gets solved and what connections we made with the story. I always give the kiddos time to discuss the story when we are finished. My kiddos really liked this story. We had a lovely discussion about what it means to be shy and how we could help others who are shy to feel more comfortable. If you are looking for other reading responses that could be used with this book, or any book, I have a whole Reading Response Product! These are low prep, just print and go! 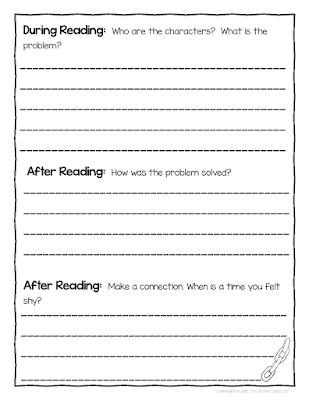 If you prefer to have enough for a week or a month of responses, print, staple, and cut to make reading response journals! It also includes rubrics to take grades on your kiddos responses! I have bought several books lately to talk about during Book Talk Tuesday! Comment below with the book you would like to see next and your e-mail address. 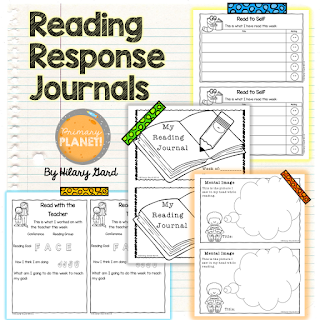 If I choose the book you suggest, I will send you my Reading Response Journals for free! Snappsy the Alligator! I LOVED Shy, too! Woo-Hoo! 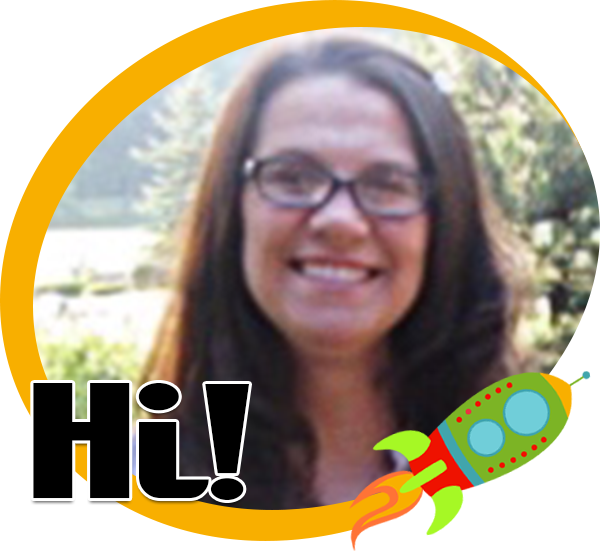 I am doing my next Book Talk Tuesday on Snappsy! I will need your e-mail address to send you the Reading Responses! Thanks for stopping by and playing along! Hi there! Thanks for stopping by and playing along! I am going to do Snappsy next, but stayed tuned for Penguin Problems in the future! I vote for Worm Loves Worm. Thanks for sharing about this book. I love finding new books to read. Hi there! Thanks for stopping by and playing along! I am going to do Snappsy next, but stayed tuned for Worm Loves Worm in the future!